Hi there. 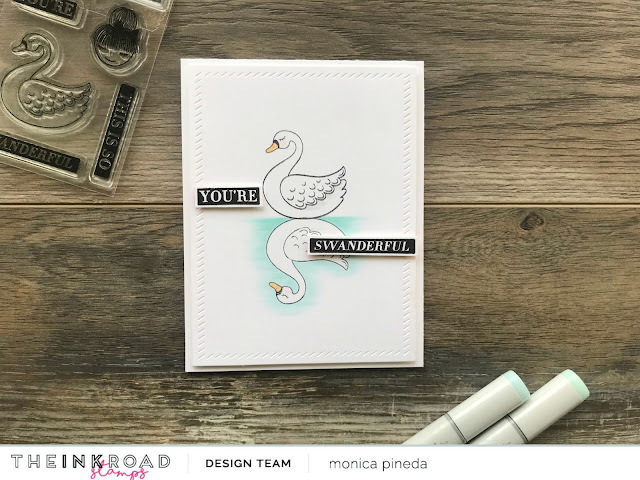 Monica here with a clean and simple mirror stamped card. This was quick and easy to make. Let’s get right into how I put the card together. I cut a panel using the Finished Frames die from Avery Elle. I lightly penciled in a line in the middle of the panel. Using a piece of red rubber from So Suzy Stamps I stamped the swan image onto the rubber using the Misti stamping tool. 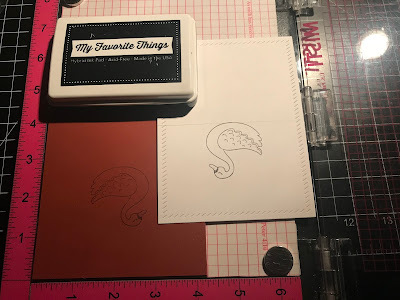 I picked up the image with the die cut panel while the ink was still wet. I just turned the panel over onto the rubber stamped image and gave it a good rub from behind to pick up the image. I used Black Licorice hybrid ink from My Favorite Things so I could use Copic markers to color around the images. This gorgeous swan is from the Swanderful stamp set from The Ink Road. I brought the images to life with some Copic markers. I added foam tape behind the swan panel for some dimension. 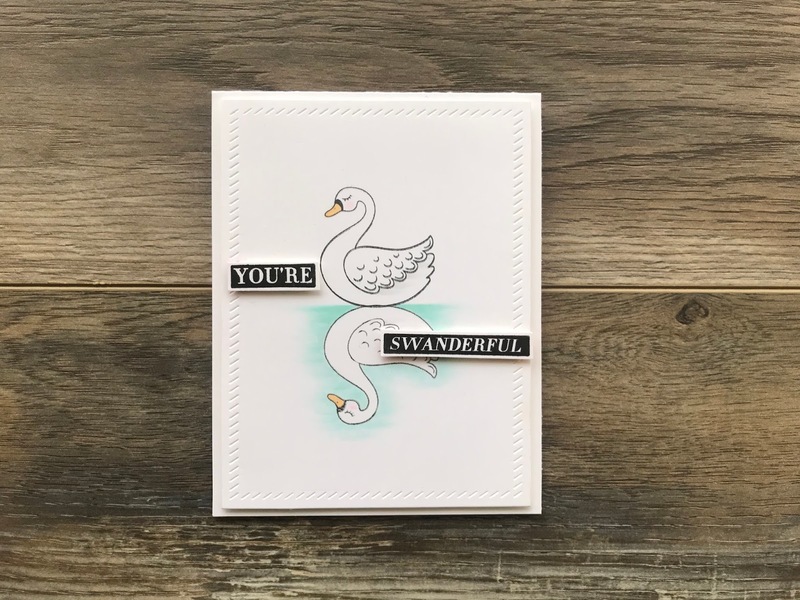 The sentiment is from the same Swanderful stamp set. I stamped the sentiments and gave them a quick trim with some scissors and added foam tape behind them for some interest. That’s it, clean and simple. I hope you give this card a try. Thanks for visiting, see you soon. Wow! 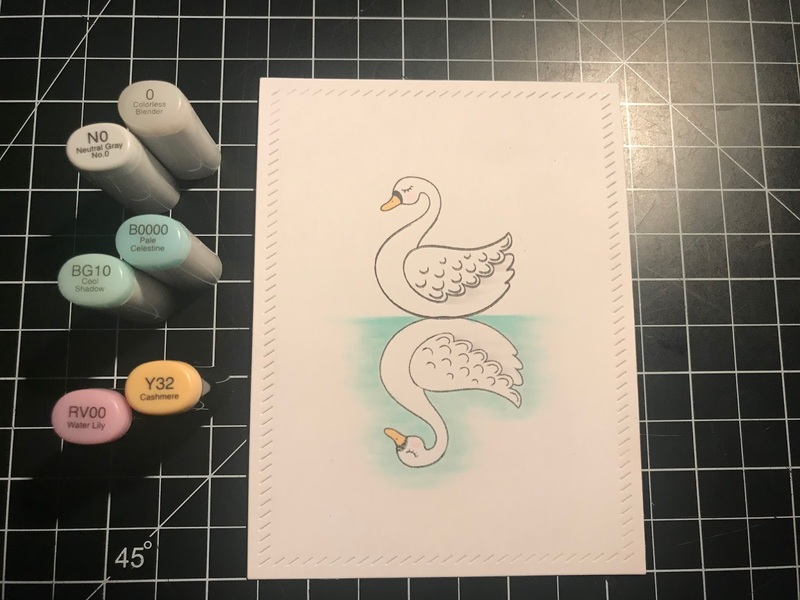 Thank you for sharing this beautiful card!